Blade length :　75.4　cm or 29.7 inches. Sori : 1.6 cm or 0.63 inches. Width at the Kissaki : 2.11 cm or 0.83inches. Kasane : 0.65 cm or 0.256 inches. Era : Edo period Keian era. 1648.
and thick with rather deep sori and long Kissaki nice looking shape. which is called Konuka had, Hizen texture with utsuri. Hamon :Konie deck like Nioi deck Cyoji midair hamon with ash and yo work. In side of the Hamon, sunagashi and also kinsuji work. in 1634 at the age of 37. He passed away in 1691, aged 94.
of the sword smith of the Koshiro clan. and his sword was ranked at Shinto-Josaku. Brilliant hamon reminds us of a cumulonimbus cloud in summer. Many sword collectors love his hamon that is rich in originality. Saya :red brown color saya. small kiss on the saya. Tsuba :Mokko style thick brass Tsuba, on the mimi, some design engraved. 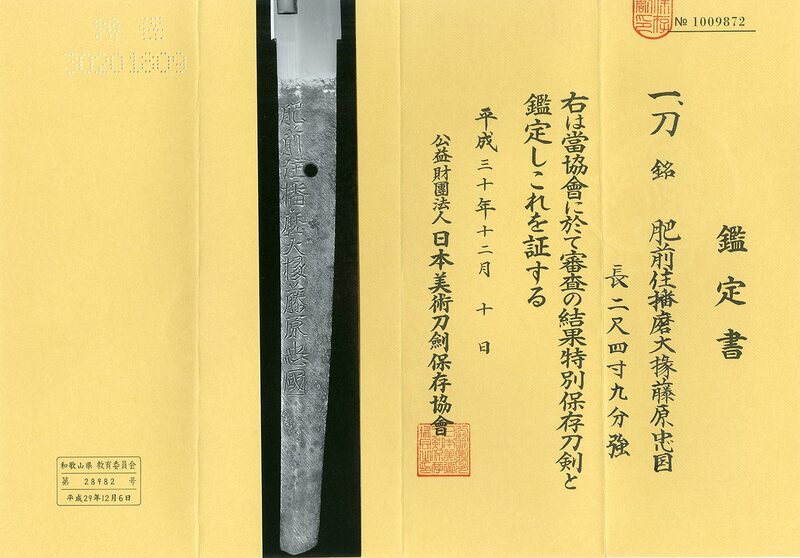 and also　Roman character are engraved: signature:Hirado Jyu Kunishige. and Roman character are engraved with gold color. Menuki : Shells are engraved. and longer kissaki nice looking shapewhich is typical Hizen texture. The Hamon is Yoshioka Ichimonji with utssuri nice elegant hamon. Generallu His Hamon looks summer clouds but this sword is ichimonji style. the sword is nice active hamon and Utauri appear. The Koshirae is nice issakau koshirae hirado Kunishige nice quite different Japanese style. We recommend this nice sword and also fantasticc Koshirae.